The preliminary autopsy on Freddie Gray shows no evidence that his fatal injuries ‒ broken vertebrae and an injured voice box ‒ occurred during his arrest. It does show that he likely received a head injury while being transported, local WJLA reported. Commissioner Anthony Batts announced Thursday morning that the Baltimore PD had turned over the results of its preliminary investigation to the Office of the State’s Attorney for Baltimore City a day earlier than his self-imposed deadline. The medical examiner found that Gray’s neck was most likely broken when he slammed into the back of the police transport van, sources who were briefed on the findings told the ABC affiliate. He also suffered a head injury that appears to match a bolt in the back of the van. “It’s also unclear whether Gray’s head injury was voluntary or was result of some other action,” WJLA said, referring to conflicting accounts of Gray’s actions while being transported. Between the time he was arrested and the time he arrived at the police station on April 12, the police driving the van stopped four times, including one where they picked up a second detainee. That witness claimed that Gray was banging his head against walls. The autopsy showed no evidence of Gray doing that however, according to WBAL reporter Jayne Miller. Sources told her that, by the time the van made its fourth stop to pick up the second man, Gray was already unresponsive. The man told WBAL that he heard some banging noises for four seconds after he was loaded into the transport, but did not see Gray or hear him talk. Gray was not seatbelted while in the van, even after police placed him in leg shackles. It is against Baltimore Police Department policy not to belt in detainees. “They came, they did their job, they regret that someone was killed. But in their hearts and in their minds, they think that they did the right thing. And they hurt behind the backlash of it more than anything, and being left out there with no support,” the relative of one of the six officers involved with Gray’s arrest told WBAL. All six of the officers have been suspended, but only five of the six have given voluntary statements about the incident. The officer driving the van has yet to speak with authorities. The Baltimore PD turned over the results of its preliminary investigation to the Office of the State’s Attorney for Baltimore City on Thursday morning, Commissioner Anthony Batts announced. According to his self-imposed deadline, the initial report was not due until Friday. Video of Gray’s arrest shows him being dragged into the police van while screaming and appearing limp, which some people suggested meant that Gray may have sustained his injuries during the arrest. 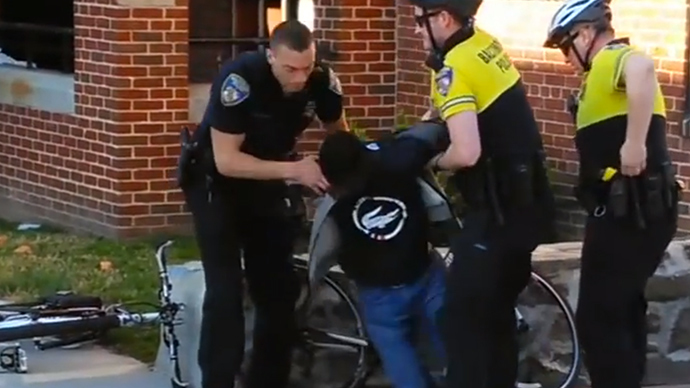 Police stepped on Gray’s back and “folded him up like a crab,” Kevin Moore, who recorded the arrest, told the Baltimore Sun. One officer put his knee on Gray’s neck and Gray complained he couldn’t breathe, Moore added. The autopsy found no evidence that Gray’s neck was broken before he entered the van, however.